In my recent quest to cook with salts from around the globe, I have also been trying a variety of olive oils, including some from Chile, Italy, Australia, France, Spain, Portugal and many other countries. Some of the differences between them are profound: some very subtle. Luckily, I have easy access to two wonderful local shops to sample the varieties: ABQ Olive Oil Company in Corrales, New Mexico (about 15 minutes from Albuquerque –http://www.abqoliveoilco.com/about.php) and Oleaceae Olive Oil in Santa Fe, New Mexico (about an hour’s drive from Albuquerque) – http://www.oleaceaeoliveoil.com. Both sell lemon scented/flavoured olive oils, but I found both rather “timid” and wanted to try making my own version. ABQ Olive Oil Co. sells it’s products online. 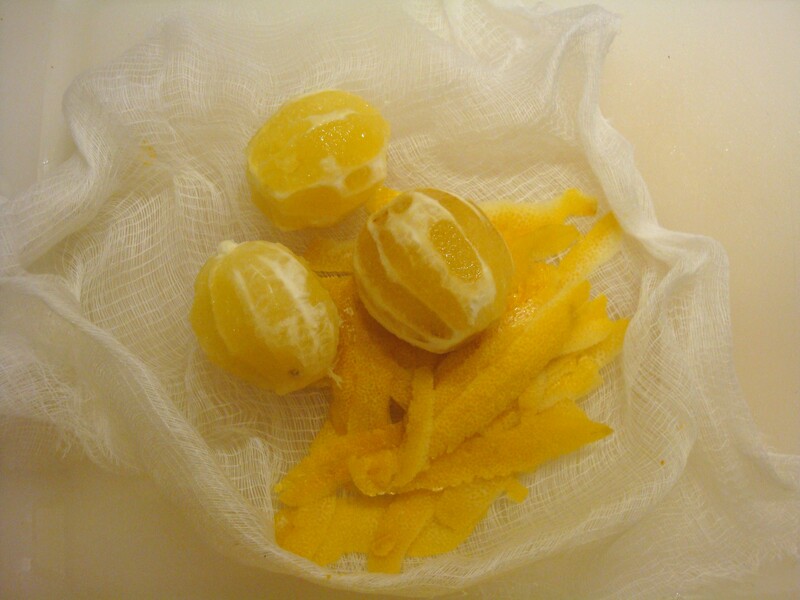 First of all, I zested three large (scrubbed and dried) lemons, into large peels, and placed them inside a large square of new cheesecloth. 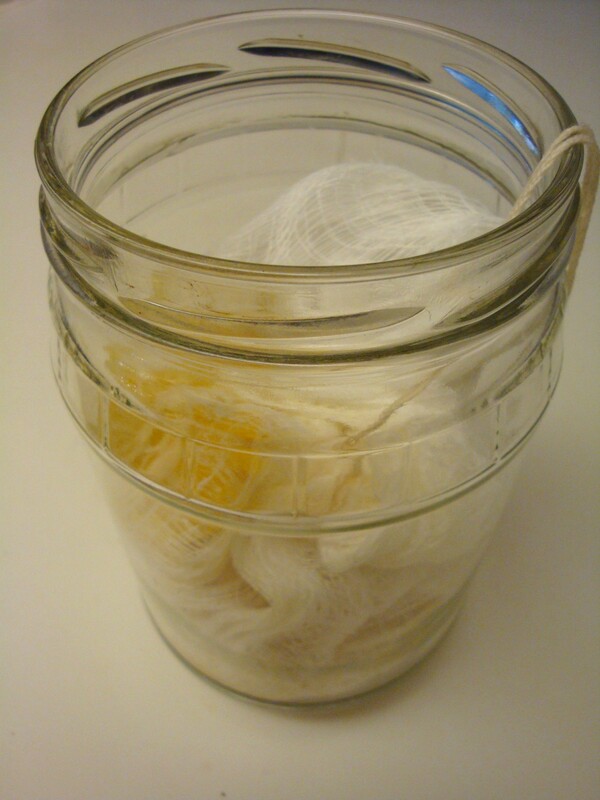 After paring off the white pith around the lemons, I also placed them, whole, along with the zest into the cheesecloth and tied the whole thing up with kitchen string. 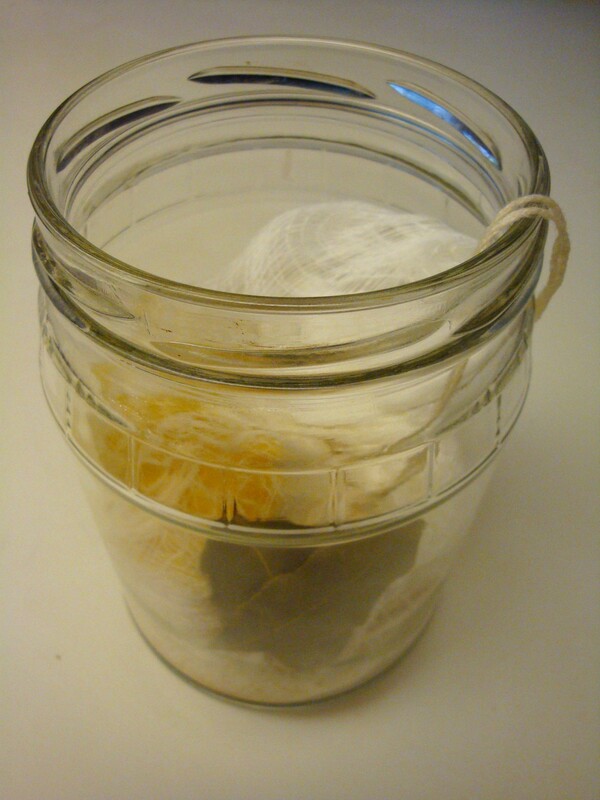 I placed the bag inside a large, clean jar, along with two bay leaves. For this exercise, I just used plain “Mediterranean Olive Oil”, from Trader Joe’s. Not high priced, nothing really special, but good olive oil, and warmed it on the stovetop until it just began to shimmer. 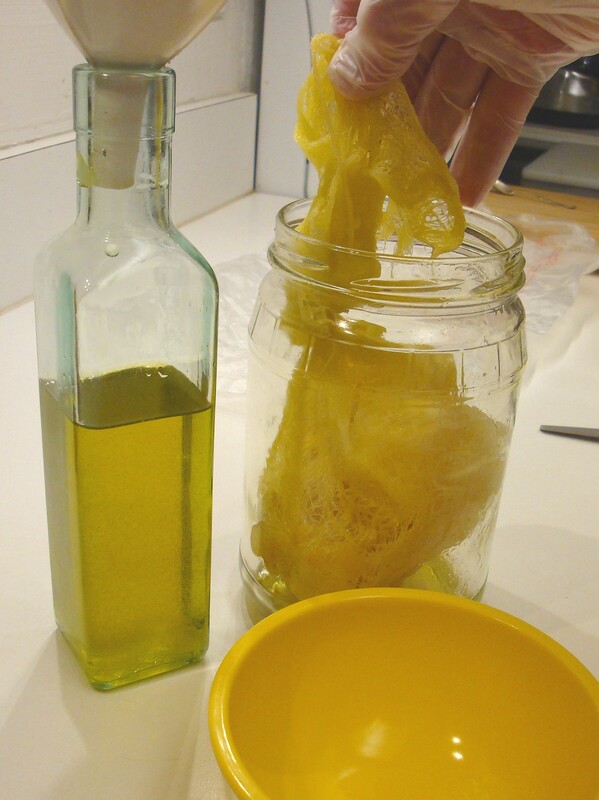 Then, I carefully and slowly poured the warmed olive oil into the jar until it was full and the cheesecloth with the lemons and their zest was covered. After cooling for about an hour, I placed the lid on it and set it aside in a corner of my kitchen counter. 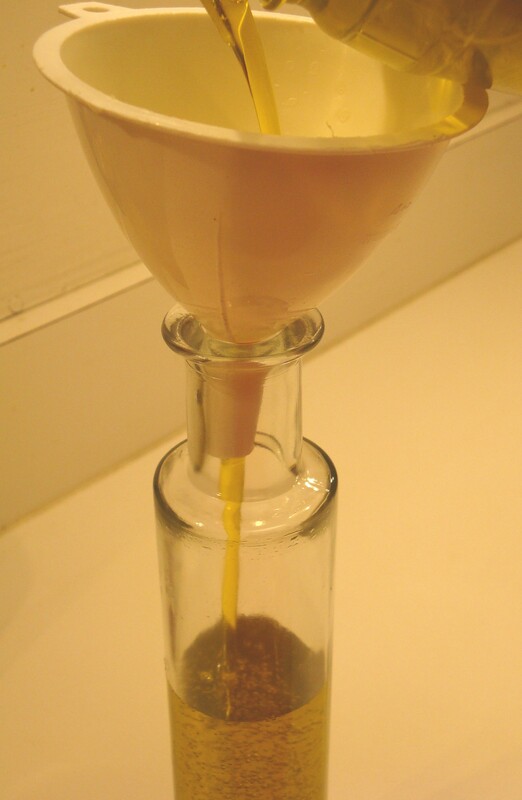 After 48 hours, I poured the olive oil into a tall bottle, also previously used for olive oil. A quick taste proved that 48 hours was enough to lend a fragrant, lemony taste, but was not overpowering. I couldn’t discern the taste of the bay leaves at all, however. 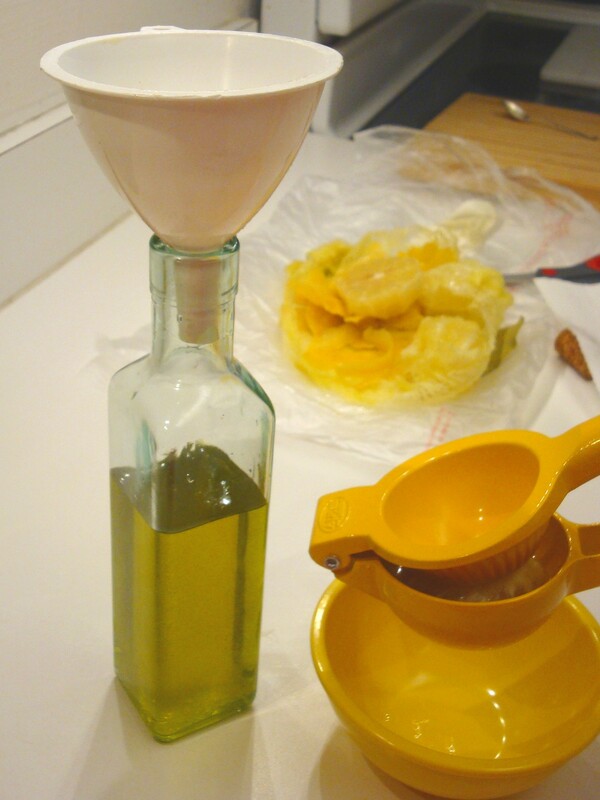 Having decanted the olive oil, I was left with enough to fill another small bottle. Into this bottle, I poured the leftover oil, but kept the whole lemons and juiced them into a small bowl, which I then strained and poured directly into the second bottle of lemon flavoured olive oil. After settling, of course, the lemon juice remained at the bottom, but shaking it up a bit resulted in a delightful lemony olive oil dressing for salads, etc. 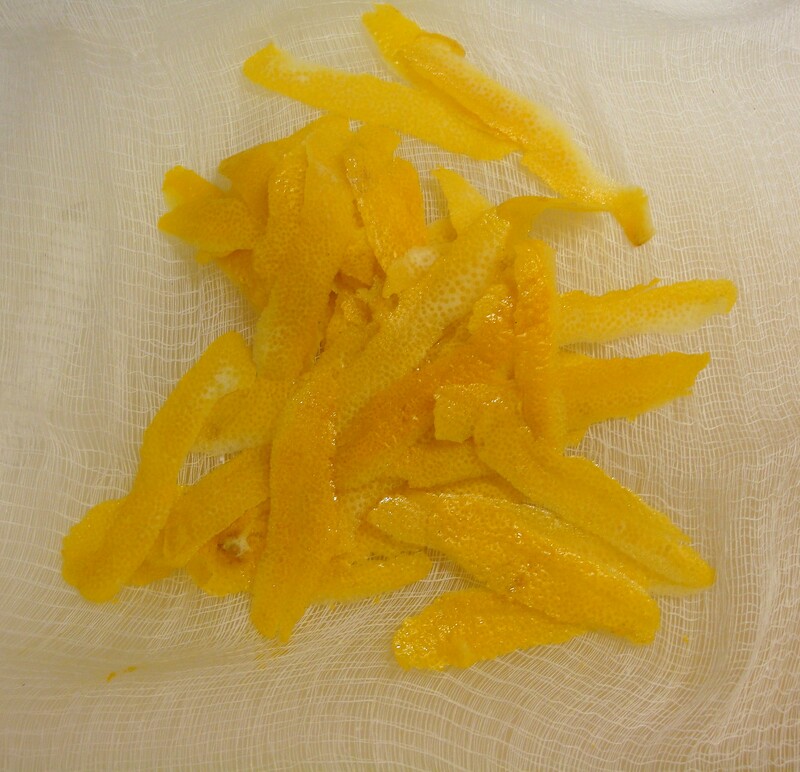 Since the lemon juice had no preservatives, however, I stored it in the refrigerator. Just a couple of minutes at room temperature is enough to make it soluble again. 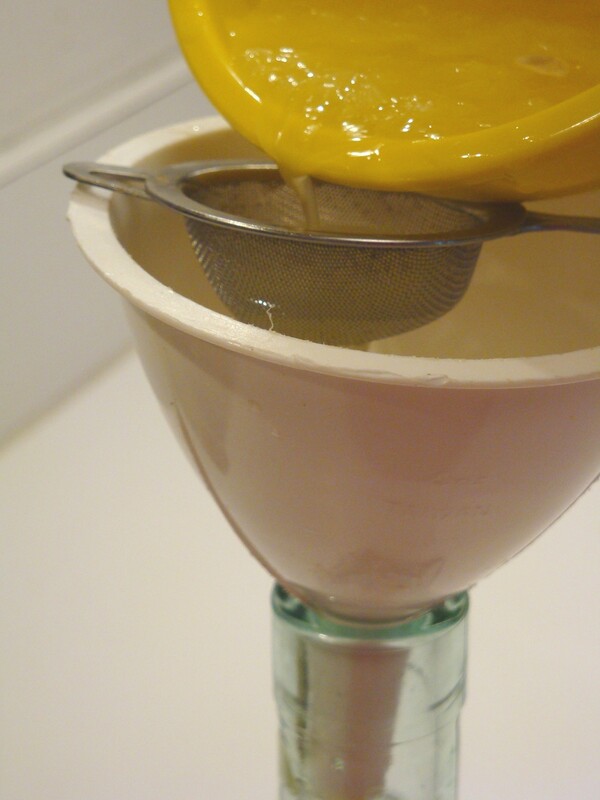 I think the trick is to start with large, fresh scrubbed lemons and good olive oil. I have seen several recipes using only the zest/peel, however, I think steeping the whole lemons as well adds more depth of flavour. Enjoy! 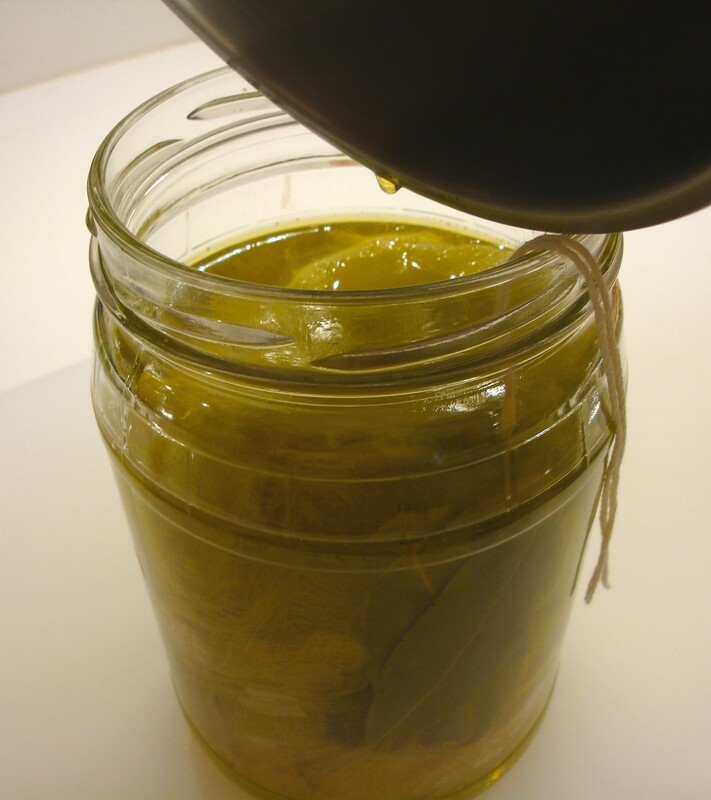 This entry was posted in Cookbooks, Cooking, Cooking Technology, Recipes, Uncategorized and tagged ABQ Olive Oil Co., Cheesecloth, Cooking, Lemon Flavored Oil, Lemon Zest, Lemons, Oleaceae Olive Oil, Olive Oil, time capsules, Trader Joe's, Trini Lopez. Bookmark the permalink. Thank you….I’m not sure if leaving the mix more than 48 hours would improve it or not. It was an arbitrary time limit, but it smelled and tasted about right to me at that time. I have the feeling that leaving it too much longer might infuse too much acidity into the oil from the lemon zest, but I’ll keep experimenting! There are plenty of lemon infused olive oils around, but after having sampled some of them, I just found them too insipid, so decided to try my own. Thanks again. I absolutely love this! What a delicious and creative option. I can’t wait to try this in my next tuna tartare!! Thanks for the recipe and all the info! !